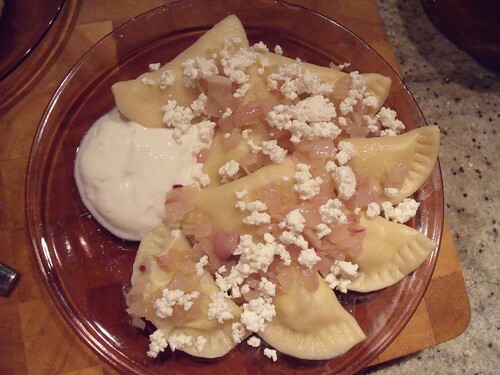 Oh, I have been waiting for a month to try this Daring Cooks’ challenge and share it: Pierogi! 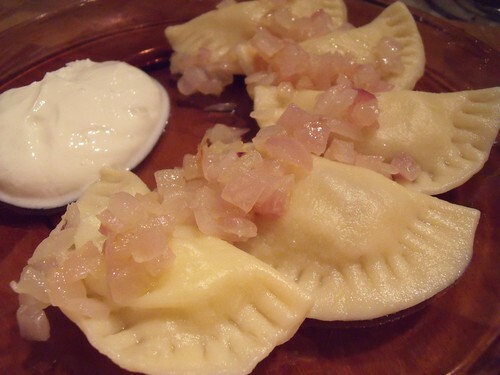 I love traditional potato-stuffed pierogi, served with sauteed onions and sour cream, but have never made them from scratch before — what a perfect opportunity! Our local market (St. Lawrence Market) has two areas: the North Farmers’ Market, only open on Saturdays (starting at 5am, yipes! ), and the South Market open Tuesday through Saturday. In the lower (basement) level of the South Market, there are all sorts of amazing food vendors serving their traditional foods. My favourite stall is right in the middle, and serves to-die-for pierogi, with soft, almost-sweet translucent onions, and full-fat sour cream. They are the perfect treat when you’re watching a bike race in the rain with the boyfriend — hearty and warming on a wet day. St. Lawrence Market also is home to St. Lawrence Hall, a gorgeous venue that hosted Swedish soprano Jenny Lind in 1851, on her farewell tour. Every year there is a Jenny Lind Competition in Sweden, and Toronto makes the list of stops on the the winning singer’s tour. Of course, the singer performs at St. Lawrence Hall. Back to pierogi — you must give this recipe a go. It’s just what I had hoped for in terms of something traditional, easy to master at a first try, and delicious. And also a great way to use up leftover mashed potatoes! 1. In a large bowl, combine all the ingredients for the filling with your hands or a spatula. Cover and set aside in the fridge. 2. Place 2 cups of flour in a large bowl and make a well in the centre. Break the egg into the centre well, add the salt and a bit of lukewarm water at a time. Bring the dough together, kneading well until you have soft dough. You may need to add more flour if the dough is too sticky, or more water if the dough is too dry. Cover the dough with a clean kitchen towel and let it rest for 20 minutes. 3. On a floured work surface, roll the dough out thinly to about 3mm thick (1/8”), and cut rounds with a 10 cm (4″) diameter round cutter or glass. Spoon a teaspoon-sized portion of the filling into the middle of each circle. Fold dough in half and pinch edges together. Seal the edges by pressing them down with a fork. Gather scraps, re-roll and fill. Repeat with remaining dough. 4. Bring a large pot of salted water to a boil. Drop in the pierogi, making sure not to add too many, keeping only a single layer in the pan. Return to the boil and reduce heat. When the pierogi rise to the surface, continue to simmer for 5 more minutes). Remove one dumpling with a slotted spoon and taste to check if it’s ready. When cooked through, remove remaining pierogi from the water. Repeat this step to cook any additional pierogi that didn’t fit in the pot the first time. 5. Serve immediately with Greek yogurt and sauteed onions. You can even add a little extra cottage cheese over top. And if you’re feeling sinful, serve with creme fraiche or full fat sour cream. You can also fry the pierogies (either from straight out of the boiling water, or cold leftovers on another day). 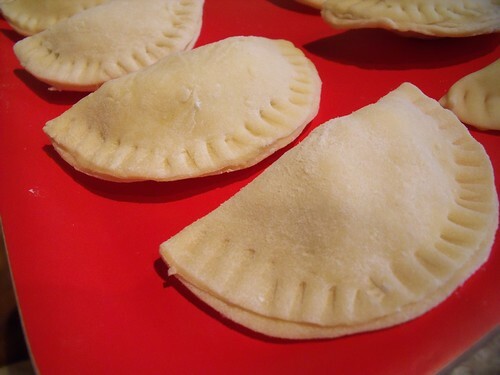 Boiled Russian pierogi can be easily frozen and re-boiled to temperature right from the freezer. Your pierogi look beautiful! I hope your home-made ones were just as good as your farmer’s market ones… they look fabulous! Thanks, Ruth! I really had a blast with these, and if I may say so myself, they were better than at the farmer’s market!!! 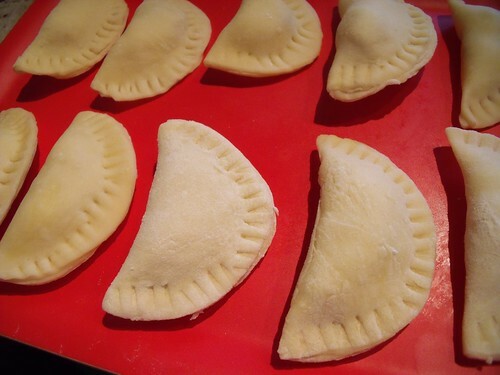 Your pierogi look great – what a lovely shape and sealing. Thanks, Anula — the pleasure was all mine to be a part of your challenge! I’m only guessing that you had fun with this month’s challenge. Bravo for you and even though you went traditional, it looks great. Thanks for dropping by, Lindsay. Glad you enjoyed the challenge. I love St.Lawrence Market too. Used to shop there when I lived in T.O. Great job on the pierogis!